For safe operation, carefully read and follow the instructions in this manual before use. The Tire Mobility Kit is a temporary fix to the tire and the tire should be inspected by an authorized Kia dealer as soon as possible. When two or more tires are flat, do not use the tire mobility kit because the supported one sealant of Tire Mobility Kit is only used for one flat tire. Do not use the Tire Mobility Kit to repair punctures in the tire walls. This can result in an accident due to tire failure. Have your tire repaired as soon as possible. 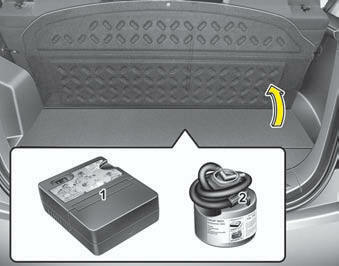 The tire may loose air pressure at any time after inflating with the Tire Mobility Kit.